Clear Saved Defaults will reset all saved defaults such as Pareto and Multi-Vari Chart settings, saved control limits, and dialog box settings. All settings are restored to the original installation defaults. Click SigmaXL > Help > SigmaXL Defaults > Clear Saved Defaults. A warning message is given prior to clearing saved defaults. The Data Selection Default setting is: Prompt me to select my data range and/or ‘Use Data Labels’. This can be changed to: Always use my pre-selected data range without prompting. ‘Data Labels’ will be used. This setting saves you from having to click Next at the start of every function, but the user is responsible to ensure that the proper data selection is made prior to starting any menu item. 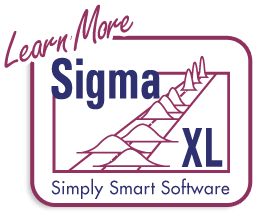 Click SigmaXL > Help > SigmaXL Defaults > Data Selection Default to make this change. This will apply permanently unless you revert back to the Prompt me setting or click Clear Saved Defaults shown above. 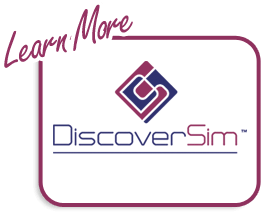 The default SigmaXL menu system groups tools by category, but this can be changed to the Six Sigma DMAIC format. 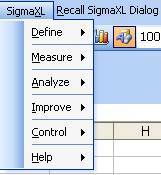 All SigmaXL tools are available with this menu format, but they are categorized using the Six Sigma DMAIC phase format. Note that some tools will appear in more than one phase. This workbook uses the classical (default) menu format, but the chapters are organized as Define, Measure, Analyze, Improve and Control.